What is Super Meal L.O.V.? A one of a kind live, organic, vegan, nutrient dense meal that is made from 36+ superfoods that include green foods, veggies, mushrooms, sprouts and more. Purium’s Super Meal is gluten-free, soy-free and caffeine-free. Super Meal - L.O.V. comes in two flavors, Vanilla Chai and Original. 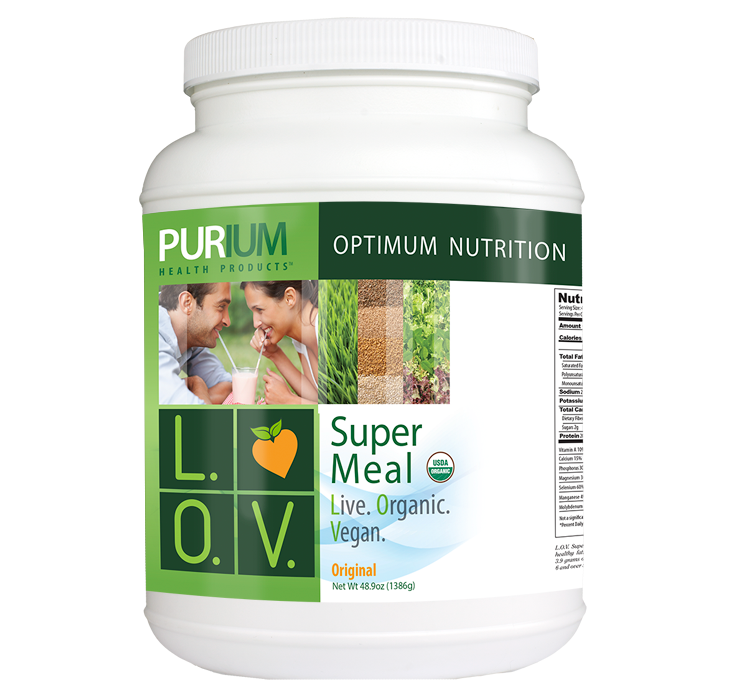 Purium’s Super Meal is also considered a Super Antioxidant Supplement + Essential Fatty Acid Supplement + Immune Support Supplement + Weight Loss Formula + Sports Performance Product + Energy Drink. Organic Dark Buckwheat - Not technically a grain, it comes from a fruit seed in the rhubarb family, and is therefore gluten free. Buckwheat contains a rich supply of flavonoids, particularly rutin, and may help regulate blood sugar and lower one’s risk of diabetes. Dark buckwheat is made from unhulled seeds and has more fiber than its lighter counterpart. Very high in many vitamins and minerals, especially vitamin K, vitamin B1, B2, B3, B6, B9, magnesium, potassium, phosphorus, zinc, iron, copper, and manganese. Organic Maca - Used by the Andean people for two thousand years, Maca is often cited as the food Inca imperial warriors ate before battle. Maca is an amazing source of energy that has gained widespread attention for its role in improving the libidos of both males and females - this is thought to be due to the optimum levels of nutrients it supplies which are aptly utilized by the body’s endocrine system. Organic Apple - an apple a day keeps the doctor away! They also help keep bowel distress away due to high water binding ability and may support the body’s natural defenses against breast cancer. Organic Sunflower sprouts - High in vitamins A and C.
Amaranth sprouts - Great sources of most of the B vitamins and vitamin A and are also considered anti-diarrheal and anti-hemorrhagic. Organic Lentil Sprouts - Great source of protein (1 cup equals approx 45 g of protein), vitamins A, B, C and E, the minerals iron, calcium, and phosphorus. Organic Shitake Mushroom - supports the immune system, is a rich source of iron, great source of vitamin B2, B5 and B6, and a good source of fiber, protein, vitamin D2 and magnesium. Studies show that Shitake also benefit one’s cardiovascular system and provide anti-carcinogenic support. Organic Sea Kelp - Known to contain over 96 different minerals and trace minerals. This food (and sea vegetables in general) is nature`s most potent mineral rich whole foods. The iodine in green kelp is helpful for people with thyroid problems. Sea vegetables offer the broadest range of minerals of any food, containing virtually all the minerals found in the ocean- the same minerals that are in human blood.